GEF Kaleo is an online knowledge sharing system powered by machine learning. Its purpose is to provide a “question and answer” platform to service GEF partners and stakeholders across the globe. GEF Kaleo is able to give answers to common questions about the GEF that are vetted by experts and updated on a regular basis. Topics such as GEF policies and procedures are comprehensively covered in a way that is fast, bite-sized, and accurate. Using GEF Kaleo is faster than alternative methods, such as making multiple calls or inquiries, and the platform is accessible at any time of the day, eliminating the need to manage time zone differences. To access GEF Kaleo, a user must first create an account and link it to an existing email address. After registering, the user can sign in to ask a question at any time. Upon asking a question, GEF Kaleo will issue an immediate response that lists several curated answers that correspond to the question and are currently stored in the GEF Kaleo Knowledgebase. The user can then select the most suitable answer from the list. If a suitable answer is not immediately available, the user can submit the question for further evaluation, and it will automatically be routed to a designated GEF expert. The user will then receive a response from the GEF expert via email. The question will then be added to the GEF Kaleo Knowledgebase and become available for any other users who submit a similar question. In this way, GEF Kaleo users will assist with building and expanding the GEF Kaleo Knowledgebase. GEF Kaleo can be accessed from any page on the GEF website using the Kaleo search bar widget, found under the “About” tab of the Knowledge and Learning page, or on the right-hand side of most GEF webpages. 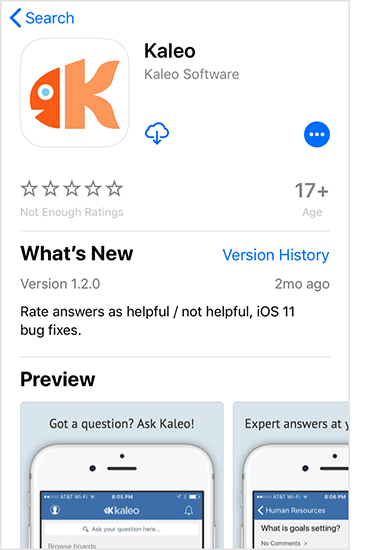 GEF Kaleo, the on-line “ask-the -expert” tool for the GEF, now has an App, available for use on your mobile phones! Please find instructions for mobile access to GEF Kaleo (Android and iOS Applications) at the links below. Each link provides you with instructions on how to download and login, and the basics on how to use the Apps. NB: If you don't have an account already, please create one by clicking on the Kaleo widget on the GEF website. For more information consult the GEF Kaleo User Guide.